An interesting find on the British Pathe site! A 60second clip of UCD students outside Earlsfort Terrace performing a “skit” on the Ku Klux Klan during Rag Week in the 1930s/40s (?). Click the image below to see the full movie. 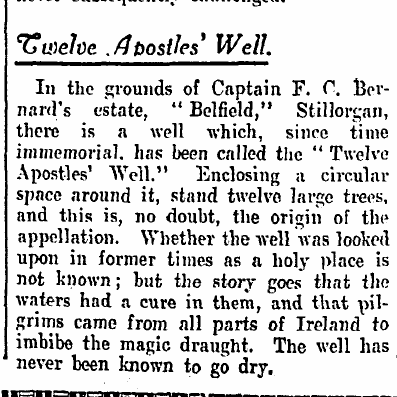 Many thanks to John O’Dowd for spotting the above reference in The Irish Times. He even got in contact with Aidan Grannell, Head of Buildings and Services, who retrieved the old estate maps of Belfield. Through these they was able to discover that the Twelve Apostles’ Well is buried pretty much dead centre under the dual carriageway, opposite the Montrose Hotel. Bread and Roses was a Women’s Lib. fanzine published by women in Belfield in the mid 1970s. It was a crudely designed, black and white, 18 page stapled zine. The slogan “Bread and Roses” originated in a poem of that name by James Oppenheim, published in The American Magazine in December 1911, which attributed it to “the women in the West.” It is commonly associated with a textile strike in Lawrence, Massachusetts during January-March 1912, now often known as the “Bread and Roses strike”. I’ve been passed on issues 2 and 3. I’ve uploaded issue 2 (see below) and will get around to issue 3 as soon as possible. I’m not sure how many issues were published altogether. If anyone has any other copies, please get in touch. Bread and Roses, Issue 2. Front Cover. Conor James McKinney from T.C.D. 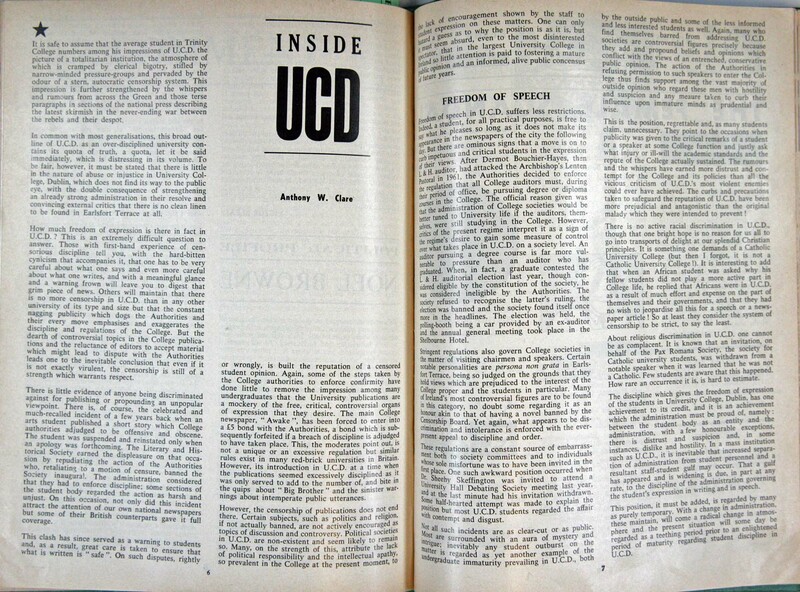 Miscellany has very kindly sent me on a very interesting article that was written in the magazine in 1962 by Anthony Clare about the censorship regime in UCD at that time. You should be able to read it by clicking the picture below and zooming in. In 1955 a group of UCD students occupied Nelson’s pillar and tried to melt the statue with homemade “flame throwers”.